Here’s a quick update on my high yield, low risk portfolio, which has now doubled in value over the last six years. Hopefully this review will give you some ideas about how you can perform your own portfolio review, which is a critical part of being a good investor. The first thing is to review your investment goals. One final long-term goal is that I would like the portfolio to reach one million pounds within 20 to 30 years, from a starting value of £50,000 (requiring an annualised growth rate of 10% to 15%). My preferred route to tracking performance is to set up virtual portfolios. I do this with ShareScope, but a spreadsheet can also do the job (have a look at my Portfolio Analysis Spreadsheet on this page for an example of how a spreadsheet can automatically update share prices). I have one virtual portfolio that matches my real world portfolio (but without all the cash in- and out-flows that complicate matters) and another that tracks the market index. You can calculate annualised returns using the XIRR (internal rate of return) function in Excel. Other spreadsheet systems usually have something similar and there are online IRR calculators as well. Generally I’m happy if the portfolio is beating the market index and producing double digit annual returns, so of course I’m pleased with its five-year annualised return of 13.1% per year. However, this very good result has been helped by a market (i.e. the FTSE All-Share) which has produced annualised returns of 9.5% per year over those same five years. That’s well above average, so it’s likely that both the market and the model portfolio will generate lower returns in future. But if the portfolio stays 3% or so ahead of the market each year (on average) then I’ll be happy. So growth is on target, but what about the dividend yield? 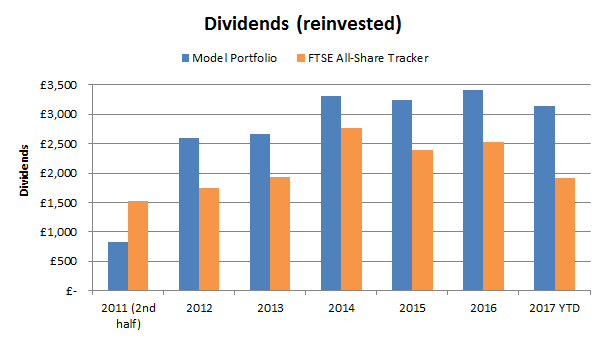 As well as beating the market in terms of growth, the portfolio has also managed to generate more income every year since 2012 (which was its first full year of dividend payments). 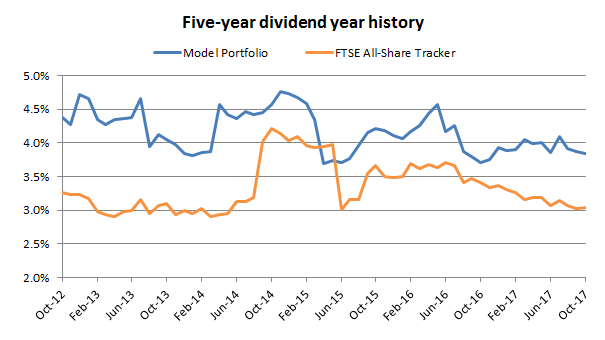 Other than a slight blip in 2015 (when the index tracker’s yield jumped up because of a change to its dividend payment date policy) the model portfolio has always had a yield almost 1% higher, so its high yield goal has obviously been achieved. 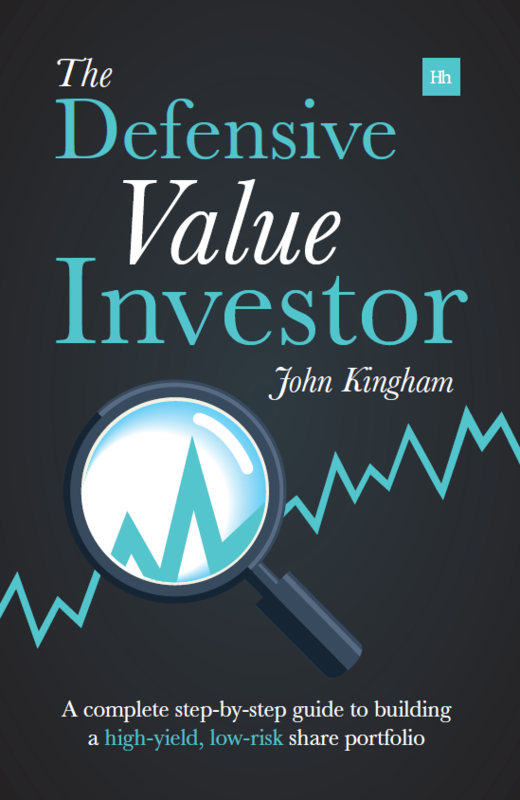 If you use a virtual portfolio then tracking dividends is fairly easy. Just check your real-world portfolio at the end of each month and add any new dividends to your spreadsheet (or if you use ShareScope this is done automatically). So that’s growth and income, what about risk? I have learned from bitter experience that I don’t like my portfolio to be volatile, and I think that’s true of many investors. So what I want is more income and more growth than the market, but with less risk. My preferred measure of risk is to look at how much a portfolio has declined in value from its previous peak at various points in the past. For example, if the market repeatedly declines by 20% from its peak value and my portfolio never declines by more than 10%, then I think it’s fair to say that over that period my portfolio was less risky. Again, this is easy to calculate if you use Excel’s MAX function (or equivalent) to keep track of a portfolio’s maximum value to date. 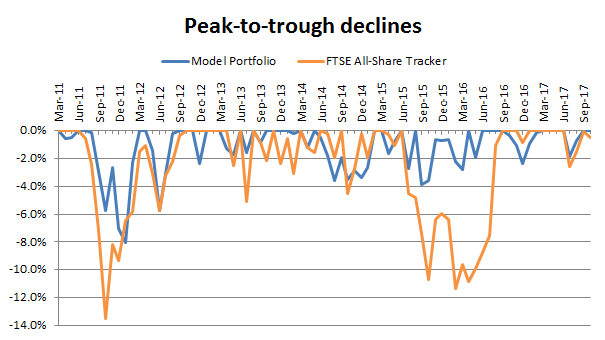 As you can see from the chart, the All-Share tracker declined by more than 10% in 2011 and again in 2016/2016, while the model portfolio did not. In fact, in the 2015/2016 mini-slump the model portfolio fell by no more than 4%, which I doubt would stress even the most cautious of equity investors. That at least gives me some confidence that the model portfolio will hold up well in the next bear market. Since the portfolio has produced higher returns than the market and has suffered smaller declines, it should also have higher risk-adjusted returns. One measure of risk-adjusted returns is the Sharpe Ratio, which is used by FE Trustnet and others to measure fund performance. Risk: The portfolio’s standard deviation, which is a measure of volatility. My spreadsheet tells me that the FTSE All-Share tracker generated average annual returns some 6.1% above the risk free since the start of 2012. As you might expect, this is slightly less than the model portfolio, which produced average annual excess returns of 8.5%. 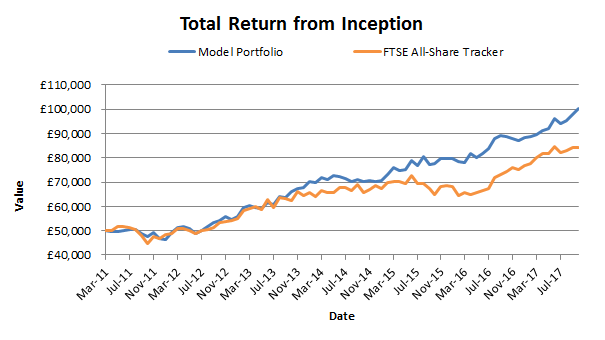 On the risk side of things, the All-Share had a standard deviation of 9.7% compared to the model portfolio’s 6.9%, so the model portfolio has been less risky whilst producing higher returns. Those numbers give a Sharpe ratio of 0.63 for the All-Share and 1.24 for the model portfolio. This means the model portfolio has returned 1.24% of excess returns (above the risk-free 3.5%) for each percentage point of volatility compared to 0.63% for the All-Share. In other words, about twice as much. Okay so returns are high, the yield is high and risk is low. But how much effort has this all taken? I have neither the time nor the inclination to sit staring at a Bloomberg terminal all day. Instead, I want to be able to get decent returns from the stock market with just a few hours of effort each month. That’s partly why I lock myself into a fixed schedule of buying or selling just one company each month. One monthly trade gives me plenty of opportunity to continually improve the portfolio, but it also forces me to mostly do nothing with the portfolio, and doing nothing is quite often the best thing you can do. The idea is that these regular but infrequent changes to the portfolio will be enough to constantly nudge it towards better companies at lower prices. That should, in theory, help to keep the growth rate and dividend yield up, and the risks down. So as an investor I would say you should expect to spend at least 90% of your time doing nothing with your portfolio. And while that may sound boring, it does mean you’ll have more time to do other things. John, where exactly is your portfolio overview? I have followed a few links but have only found example/model ones, not the one you describe here. Hi HH, the portfolio mentioned in the blog post is indeed the model/example portfolio. The problem you have is that the MSCI World ETF did 120% in the same period. The investor just needed to accept the market return, nothing else. And we don’t speak here about Terry Smith’s Fundsmith fund but about an index widely available to invest in. This shows how dificult is for the active investor to do something meaningful. Fist of all, it’s important for investors to have a single, relevant benchmark against which they can consistently compare their performance over the long-term. In 2011 I chose the FTSE All-Share as my benchmark because all my holdings are selected from that index. My portfolio’s large, mid and small-cap weightings are also not a million miles away from the All-Share’s (currently 40% large, 50% mid and 10% small-cap for my portfolio). The MSCI World index is not my benchmark so its performance is simply not relevant to my portfolio. In fact, it wouldn’t even be a good benchmark for me because the world index is 60% weighted towards US stocks, of which I own none. The same thinking applies to the thousands of other indices, ETFs and actively managed funds which are also not my benchmark. Their performance is simply irrelevant to me. The simple truth is that there will always be some investment somewhere that absolutely trounces my portfolio, your portfolio or anyone else’s portfolio. For example, you could have compared my portfolio to the “Direxion Daily Semiconductor Bull 3x Shares ETF”, which has returned 2075% over the last five years, or the less extreme “ProShares Ultra S&P 500 ETF”, which has returned 238% over five years. But those ETF have nothing to do with my portfolio and neither does the MSCI world index. So rather than trying to beat every possible investment on the plan, I think active investors should just pick a relevant benchmark and then try to beat that benchmark, and that’s all I’ve tried to do. This also applies to Fundsmith. 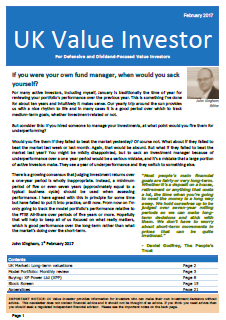 The Fundsmith fund has had good performance over the last few years, but it’s not my benchmark so it’s not relevant. I simply don’t compare myself to the Fundsmith fund for the same reason that I don’t compare myself to the Legg Mason Japan Equity fund, which returned an amazing 310% over the last five years. Where is the most reliable source for FTSE All Share (Tracker) Yields? There are lots of different All-Share trackers and offhand I can’t think of any single source that has data on all of them. Perhaps a search on a stockbroker site might work. At the end of September its yield was 3.08%, somewhat lower than the actual index’s yield because of trading fees and management expenses I suspect.